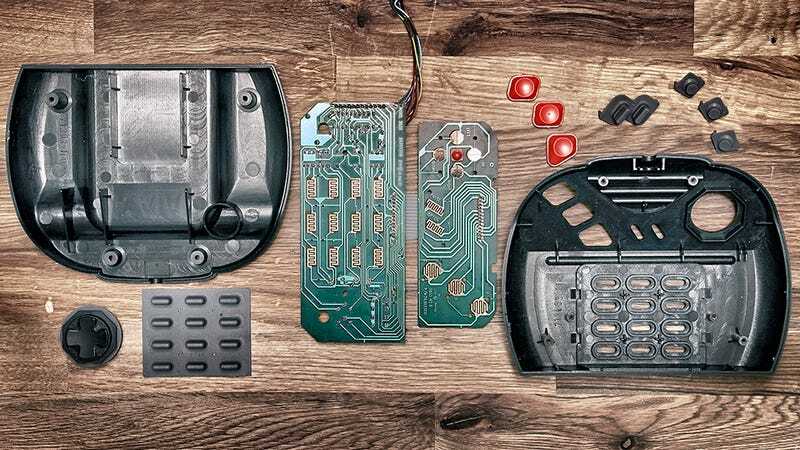 Above, you're looking at the surgically disassembled guts of an old Jaguar controller, the short-lived console originally released by Atari in 1993. It's a thing of beauty, and just one of a series that's equal parts nostalgia and drool. Brandon Allen's photos of dissected gamepads are nothing short of breathtaking. A strange obsession with the internal workings of these old school controllers seized upon Allen's mind, and so took them apart with a clinical eye, and a whole lot of patience. Allen's two-part "Deconstructed" series attacks everything from the simple original NES controller to the crazy multi-button game pads of today. There's no PS4 and Xbox One controllers in the set just yet. "I can't wait to tear those suckers apart," he told me by email. We can't wait for him to either. Check out a few below, and make sure to head over to Allen's site to see the entirety of Deconstructed Part 1 and Deconstructed Part 2—as well as to order prints.